Many thanks for the pictures of Boggart Hole Clough I enjoyed them and have taken a copy to show the family. I remember being told the story of the Boggarts. What a pity this great park is being neglected. To me it is better than New York's Central Park because it has all the hills and valleys and did have such a display of plant life and flowers. Did you know that just above a wooden bridge over one of the streams there was a bandstand and on Sundays one could sit and listen to the music. It isalso connected to the area known as Lewis's rec. the flat area around Blackley Library. There are two very steep paths from there going into the Clough, one known as Valentine's Brew!. Yes, like all Manchester's parks, it deteriorated during the 1970's and 1980's, but Boggart Hole Clough is already being repaired and improved for the Commonwealth Games. But maybe it will always be best as it looks in our memories of earlier days. More pictures of Boggart Hole Clough to come soon. Aidan Old Mate. 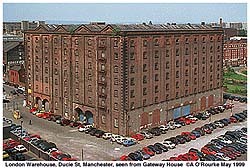 Thought you piece on Ancoats exceptional, brought back untold memories. One thing though, what ever happend to Ardwick "Out Patients Hospital" That den of Horror that I spent many days in the 1930's due to Ear problems. Thanks again. Tony Barlow in Arizona. Ancoats Hospital building is still there, but unused - there's a clinic next to it, so the site is still being used for medical purposes. If you want to know how it looked around fifty years ago, have a look at LS Lowry's painting of the waiting hall, on display at the Lowry Centre, Salford Quays. Aidan, I've just read through your Nighttime Manchester article. Great stuff. Brings back happy memories from '91-'93 and Friday nights out for a few pints with the lads from Manchester Polly. (now Manchester Metropolitan University). Super atmospheric photos. I could almost smell the place. Looking forward to part 2. David Barry Calgary, Alberta. 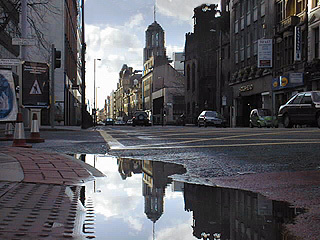 Glad my photos captured the atmosphere -sometimes seedy, sometimes glamorous, of the city centre. More in Part Two to be uploaded shortly. Waaaaaaah! you've done it again! The latest offering about Ancoats is superb. As you know I was over there in late January-early February. 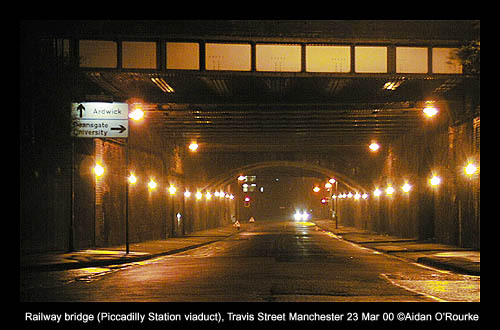 I took a couple of pictures from Piccadilly station approach. I thought they looked familiar when I had them developed. Lo and behold you have the same views on your massive creation! Aidan, I saw your request for products etc. to review on Eyewitness Manchester. Have you considered reviewing either of the UK Kosovo Refugee Relief CDs ? Volume One contains work from ZuGang from Manchester. Trevor Brown, a member of ZuGang - is currently getting a large amount of television and press interest within Manchester as part of the new School of Sound Recording course for DJ's. Volume Two has tracks from European and CDP - also from Manchester. Both CD's were compiled by myself (a Chorlton resident). To date, the project has raised over $120 for The British Red Cross and *every* sale of a CD gives another $3 to charity. The first is for the campaign for siting the new so-called "DIAMOND" synchrotron where the current UK synchrotron is (at Daresbury near Warrington) rather than in Oxfordshire. The second is a link to the heated response to Monday's decision by the government to select the Oxfordshire site, much to the horror of North West scientists, who are appalled that hundreds of these high tech jobs, deparately needed in the North West are to be moved to the already 'over-heated' South. This project is worth 175 million pounds initially, and its loss will affect science in the North West for decades (luckily I'm not directly affected)..
As I understand it, it appears that even the staff presently at the Oxfordshire site don't support the move, nor do the majority of the UK and international scientific community. However the majority of those making the decisions are based in Oxford and London. It's terrible that yet again, resources are spread unevenly across the UK, and there's a bias against certain parts of the country based on ignorance. I hope the decision is reversed and that the Daresbury centre continues to do its essential scientific research work. It seems since the opening of the new Marks and spencers store there hasn't been a lot of new news regarding the rebuilding of the City Centre on any of the related website's. Please could you update the news regarding the rebuilding of the City Centre. I'll try, based on my current knowledge, but please have a look at Euan Kellie's excellent Rebuilding Manchester website, which he is going to develop along lines you're suggesting. For instance. Are the new owners of the Arndale Centre going to redevelop the whole frontage of the Arndale centre, including the tower in time for the Commonwealth Games or are they going to leave it as it is? The tower was originally to be remodelled, but that plan appears to have been dropped. When are they going to build the winter gardens and what form will it take? The Winter Gardens are part of the next stage of the redevelopment. Cannon St will be covered over with glass and turned into an attractive indoor space. There is a debate about whether the Winter Gardens should be left open at night. Is Market Street going to be redesigned? 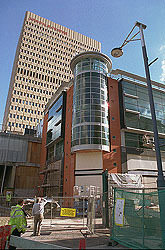 The Arndale exterior will be remodelled along Market St as well. Work is currently in progress to remove the escalator to the former Voyagers restaurant. What's the latest news on the new Cathedral street development opposite Marks and Spencers? When is it going to be built and what will it look like? The new development, titled Shambles West, will commence shortly. What's the latest news regarding Harvey Nics? I'm not sure, I think they are definitely planning a shop in Manchester. Is the frontage of the Ramada Hotel going to redeveloped in time for the Games. How many hotel's have been built and are going to be built in time for the Games. A hotel is planned for the site of Northcliffe House - Another is planned for the corner of Portland St and Sackville St on the site of the BT office building. 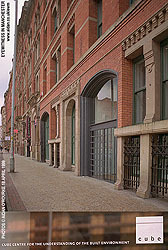 Several smaller hotels have appeared not far from the city centre - in Salford, the Campanile, for instance, and the Comfort Inn, off Hyde Road, West Gorton. There are more, I'm not sure exactly how many. Which new retail shop's and restaurant's will be coming to Manchester when the Printworks,Triangle, Great Northern warehouse and the G.MEX arch development's open this year? I'm not sure of the exact names, but you can expect a range of well-known chains. I'm personally looking forward to the IMAX cinema in the Printworks. The Council are to persist with their impractical and over-elaborate plan for Piccadilly, unless the Civic Society's 'village green' application is successful. The building may look something like this visualisation I've made. Moving forward at a slow pace - see my Ancoats feature coming very shortly - should be another Castlefield in 10 years or so - we hope! The site has been cleared - I walked past there yesterday - construction hasn't commenced yet. etc, etc? Are there any new development's which have not yet been announced? Will they be ready in time for the games? the vacant land opposite Canal street which is currently a NCP Car Park. the vacant piece of land opposite Pizza Hut on Oxford Road. Are there any plans to develop these site's or buildings before the games? 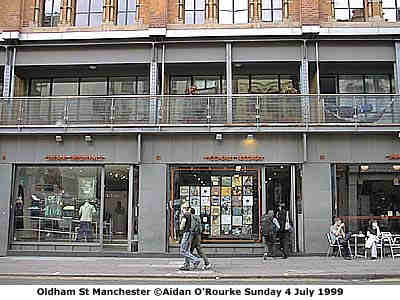 I would like to see Manchester City Council get together with the City Centre Developers and come up with a plan to redevelop the whole of Oldham Street. Yes excellent idea - have you seen my Oldham St feature? What's the point on redeveloping the whole of the city Centre and especially the Piccadilly Gardens area if there going to leave Oldham Street the way it is? 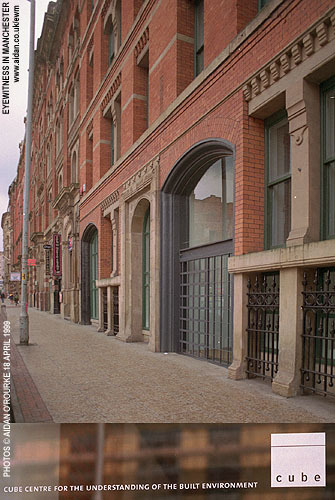 There are many attractive buildings on Oldham Street which can be redeveloped in to apartment's and shop's, why not create a Carnaby style Street just off Piccadilly Gardens? Have you noticed all the empty shop's in the City Centre? Is this the effect of the Trafford Centre or are Retailer's jockeying for positions in the new City Centre? I'm sure like Manchester many other cities in the United Kingdom are also going through major redevelopment's, It would be very interesting, if not controversial if you could create a website comparing the cities for Culture (Theatre/Museum's), Shopping (Fashion/Variety), Restaurant's (Quality/Price), Entertainment (Bar's/Club's/Family), Hotel's (Quality/price), Transport (Access/Frequency), Appearance (Cleanliness/tidiness), etc, etc. Yes, someone please give me a lot of money and I'll do it! Awarding each city points for the different categories and then producing a league table. The cities I would include are Edinburgh, Glasgow, Belfast, Newcastle, Leeds, Sheffield, Manchester, Liverpool, Birmingham, Bristol, Cardiff. Do not include London. PS. Please wait until 2002 when the centre of Manchester has been redeveloped. this will also give other cities the opportunity to complete their redevelopment. Aidan - hello. Firstly, let it be said that I have enjoyed 'tuning-in' to your eye witness in manchester web pages for over 2 years now. As an archive of excellent architecture / citynews information, it has greatly helped me write my book on recent architecture of manchester. The book is due out in June and probably launched at CUBE in architecture week. So cheers for all your effort and time / energy to create your web pages, they have been great. Secondly, I work in Birmingham (England's 3rd city - not 2nd, I may add!) and god what a horrible experience! I commute between Manchester - Birmingham at the weekends, so tuning into your EWM slot keeps me sane in the week. Join me next week for the next Eyewitness update from... Birmingham - No, only kidding, I have no plans to cover Birmingham! From what I've heard, the centre of Birmingham has been redeveloped very well - I've only visited very briefly, but driven past it on the M6/M42 many times. It's nice to hear you prefer Manchester. Good luck with your book, and glad my pages have helped you. Subject: Ex- Mancunian open L.S.Lowry Site! I thought you'd be interested with an Ex-Mancunian opening an L.S.Lowry site on the web. I grew up in Droylsden (Somerset Rd) and attended St John the Evangelist in Openshaw in the early 70's. I moved away in 1980 to California and eventually ended up living in a suburb of Chicago some ten years later. I grew up with a great interest of Lowry and when I eventually made a decent pay check, I decided to set about getting as many prints of Lowry's work as possible. Sad thing was, I couldn't find any here in the US or from any other sources in the UK. I eventually decided that many other people, not just the Ex-Brits in the US may have that need, but even the people at home in the UK. I eventually tracked down as many companies in the UK willing to sell me prints and ship them out here for me to offer for sale on the web. in the US. I am in the process of getting my banner swapped with other sites in the UK, and expand even further. I thought that you'd find this interesting and may want to check out the site and give me some feedback. PS. I've been a fan of your work for so very long and spend every Tuesday evening catching up on the weekend's news in and around Manchester. I especially like the photo's. I have the one you took a while back of Daisy Nook. It brought back many memories of my childhood, Thank you! Yes, I'm certain people will be interested - Lowry's paintings are fantastic - I feel in a small way I'm following in his footsteps, using a different medium in a different era. Glad you liked the Daisy Nook pictures. Really enjoyed your site mate. I'm an exiled Scouser living here in Melbourne Australia. Only been here 30 years! 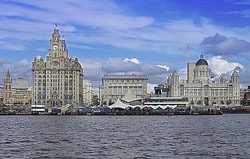 The pictures were great of Liverpool. Also Manchester. My wife lived there for a while. Also I enjoyed reading about your V W campervan. 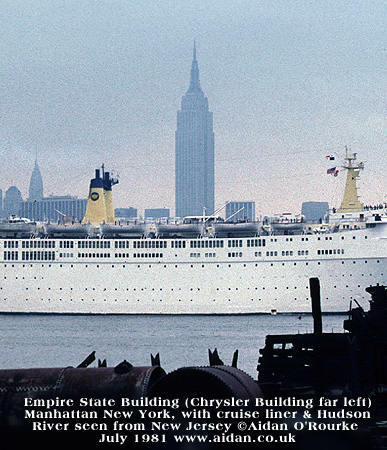 We toured Australia in a similar one in the seventies. Not quite as old as the one you had though! Luckily we didn't encounter any of the problems you had. Just thought I would drop you a line and say I enjoyed your site. read them. I was home last July and I have to agree with most you said. Liverpool is a great city - in many ways it has the edge on Manchester, for example its superb waterfront - I wish I could spend more time there. Just took a look at the clip - it worked great on my computer. I'm a native Mancunian who lives in Detroit now - your emails and photos are a great way to stay in touch with home. Keep it up. Glad you liked it - some people have been having problems running it. I'm a longtime "exile" from Manchester having resided in NY for the past 25 years. I've been a regular visitor to manchesteronline, more so since the advent of EWM. You photgraphs are stunning and make me acutely homesick at times. Yeah, I think belonging to this mailing list makes sense. Who knows? someday I may come home. VP Operations, DDF Lab, Inc. 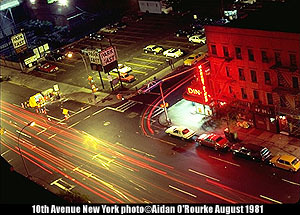 I loved New York while I was there, summer 1981 - when I took these photos. Thanks for your message and keep visiting Eyewitness in Manchester.